Are you looking for girls/child sizes? Click here. NEW! Beautiful ice skating dress has a one-shoulder design! NEW! Gorgeous competition ice skating dress with stand-out design! NEW! Amazing princess-style ice skating dress! NEW! Beautiful, warrior princess ice skating dress! NEW! A modern-classic skating dress! NEW! Jazz style ice skating dress with pizzazz! NEW! Stunning ice skating dress with plunging sweetheart neckline! NEW! Beautiful Irish-styled ice skating dress! NEW! Beautiful competition ice skating dress with swirl sweetheart bodice. NEW! Lovely ice skating dress with sweetheart bodice and deep back! Dazzling competition ice skating dress with elegant off-the-shoulder look! Stunning ice skating dress! Feel like royalty in this beautiful competition ice skating dress. Designed for a classic look! This beautiful competition ice skate dress has a geometric neckline. Romantic competition ice skating dress with deep back. A dress for skaters who like simple styles with dramatic lines! 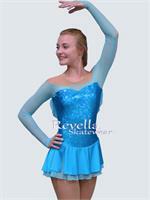 Beautiful sleeveless competition ice skating dress! Dazzling competition ice skater dress will take their breath away! Fabulous competition ice skating dress with geometric neckline. Adorable competition ice skating dress. Beautiful Spanish style competition ice skating dress. Lovely halter ice skating dress with detailed back. Gorgeous competition ice skating dress with stand-out design! Fabulous 'little black dress' - updated, modern, lovely! This is the perfect figure skating dress for gypsy or peasant music. Beautiful peasant-styled competition ice skate dress is perfect for Les Miserables music. Look like a snow queen in this lovely competition ice skating dress. Dazzling competition ice skating dress will take their breath away! Beautiful figure skating dress has lace 'wrapping' across the bodice and skirt! Dramatic competition ice skating dress with plunging sweetheart bodice. Look like a genie in this whimsical competition ice skating dress.